This lovely one bedroom/one bath condo with a balcony overlooking the pool deck and the grand lawn offers the very best Bahia has to offer. The large spacious living room, dining area with breakfast bar and your fully equipped kitchen completes your home away from home. 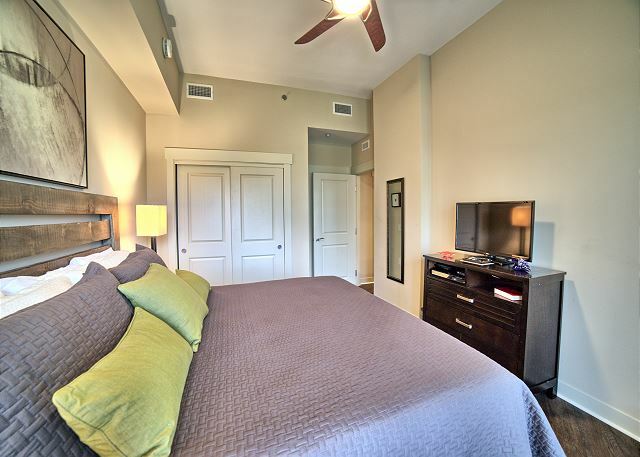 The condo has all tile flooring and new master furniture. 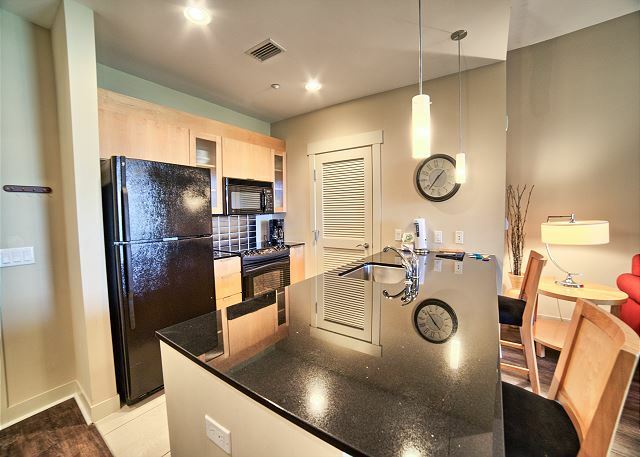 You would not be disappointed if you selected this clean and well maintained unit. 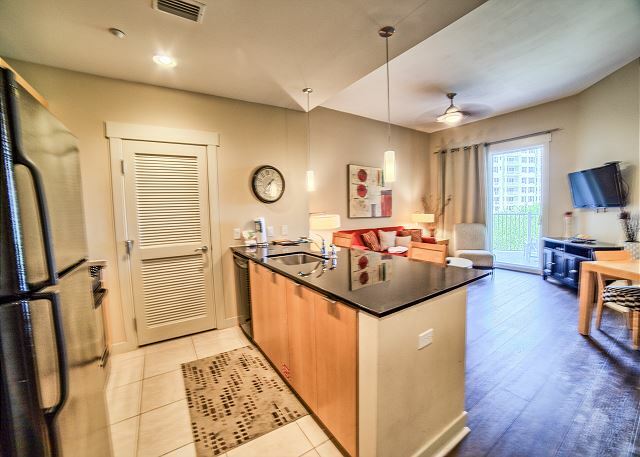 This is truly a condo where vacation memories will be made. Bahia, because of its location on the bay, is one of the preferred complexes in the Village. 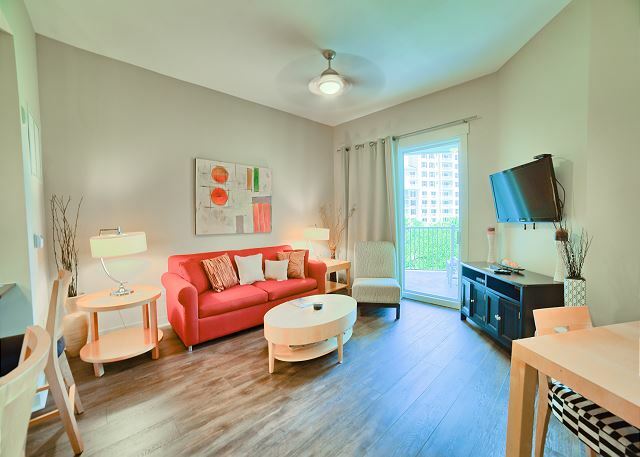 Decorated in an attractive South Beach style decor, the unit is located conveniently to all the shopping, dining and special events in the Village and is also close to the Convention Center if you are mixing business with pleasure. The Village teems with life and entertainment. The choices of restaurants abound. Music plays every night in the square or the Famous Door night club or the Rum Runners, dueling piano bar. The Village has added another dimension to the resort's incredible popularity. 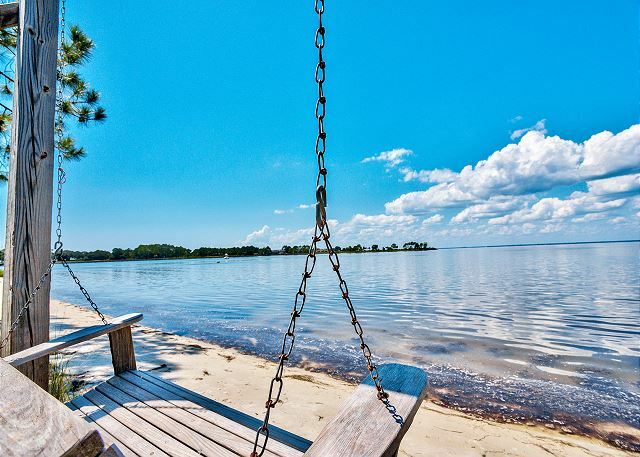 In addition to the Village itself, you can enjoy over seven miles of white sand beaches along a breathtaking shoreline, four golf courses, 18 tennis courts, a 98-slip resort marina, fishing docks... all of it accessible by walking, biking or riding the 'free' tram. 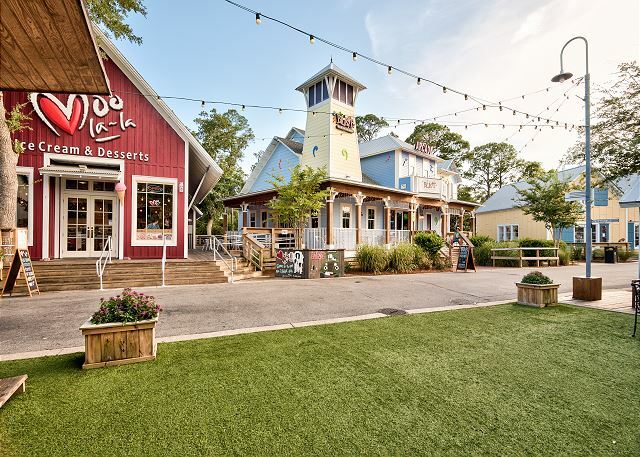 We are one mile from the Silver Sands outlet mall where you will find additional shops, restaurants and events. There is no tram service to the Outlets but there is plenty of free parking available. This was our second stay here! 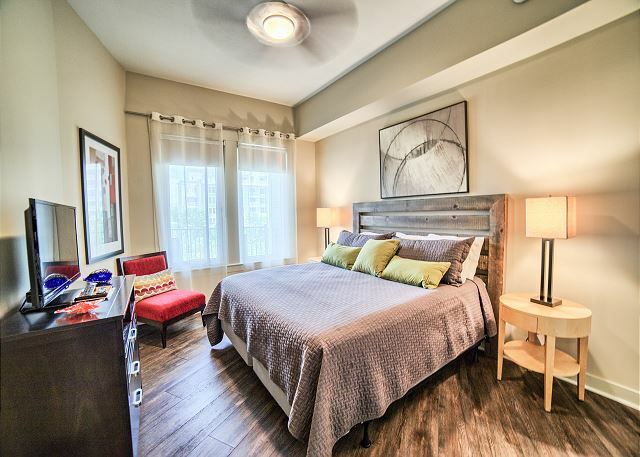 We love the area and the comfort of a familiar place! Looking forward to another stay next year!! Thank you Phyllis!! Sue, So glad you enjoyed your stay and I too look forward to next year. Travel safely going home! We have been coming to the Destin area for more than 30 years and this was our very 1st time staying at Bahia #4409. We had always stayed on the gulf side before and were a little apprehensive. Well, we has one of the best times we have ever had. It was so relaxing. 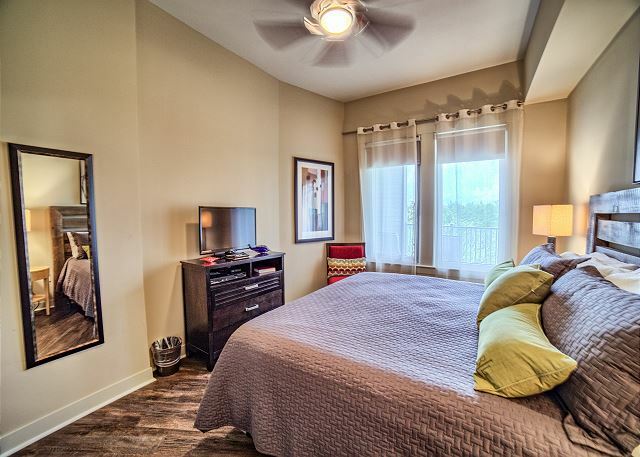 The condo is just a very shot walking distance away from the Village at Baytown Wharf. What a SUPER place. Great restaurants, shops in a simply beautiful surrounding. You can easily get to the gulf coast in a few minutes by using the tram. Did I mention the great pool? It would be a perfect place to bring along our kid and grandkids. My husband and I couldn’t have been happier with the room. It was quite large for a 1bedroom unit. The bed, furnishings and appliances were all clean and conmfortable. I would highly recommend this unit and the Sundestin area in general! My Husband and I decided to take a quick weekend getaway (without kids) and it was wonderful! 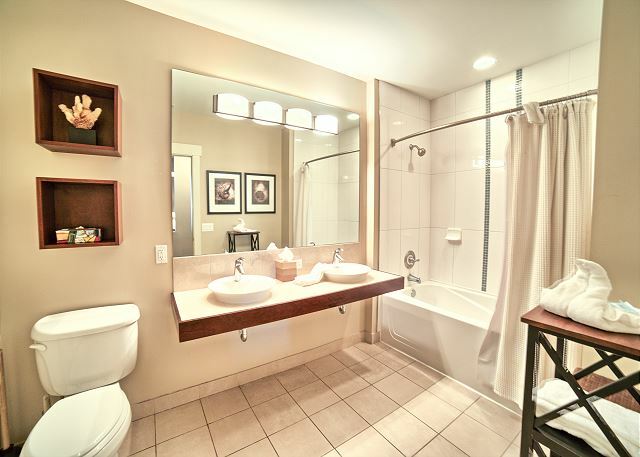 Beautiful condo, nice pool, 5 minute walk to the restaurants and shopping. We will definitely go back! Second year back and we Love it! Last year was our first stay at this location, although we have stayed at the other locations in Baytowne Wharf. This is a great property and everything went great again this year. Thank you so much Greg- we love having you and look forward to next year! 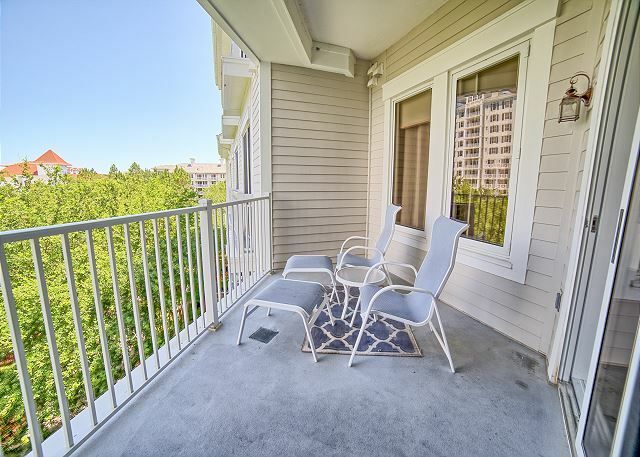 I like this condo especially for the balcony and view of the pool and property. The owners were great to work with. I will say that the internet service is spotty. Phyllis acted to improve the service and they onsite team was responsive. However even after we worked with the local guys, the strength of the signal improved but there was still periods of no service at all. Not sure why. A bit of annoyance. 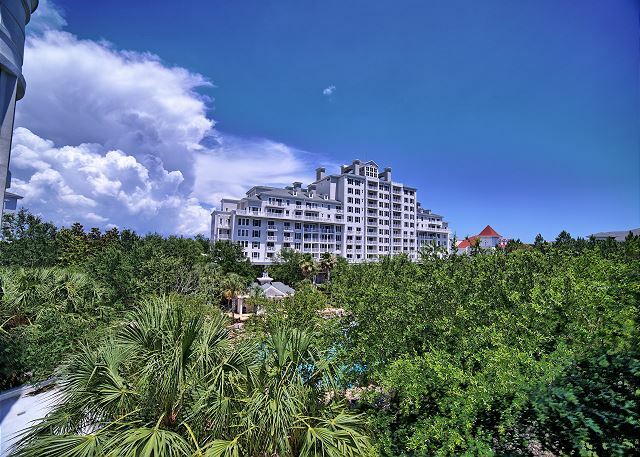 Great location & amenities. 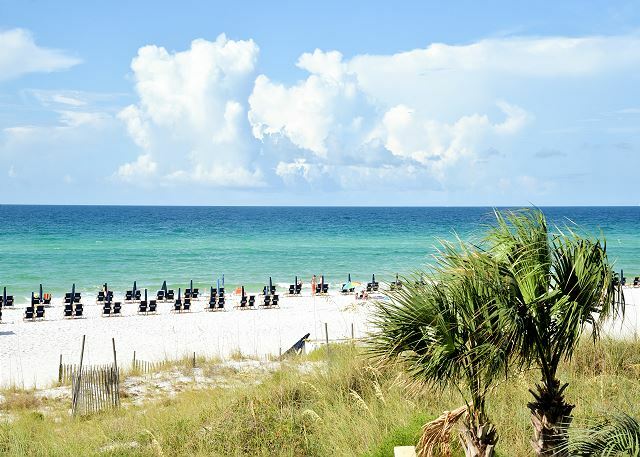 Destin Memories staff was very helpful, courteous & prompt every step of the rental process -- everything was clear & well laid out. 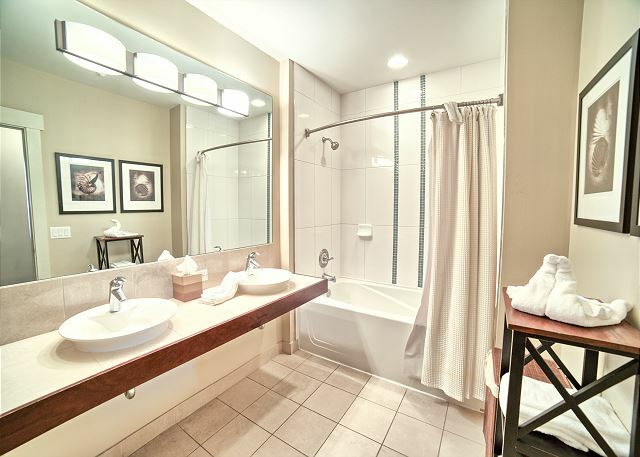 We always enjoy staying at Baytown & the Bahia property is very convenient!! Mary, Thank you so much for your review. We look forward to hosting you again in the future. 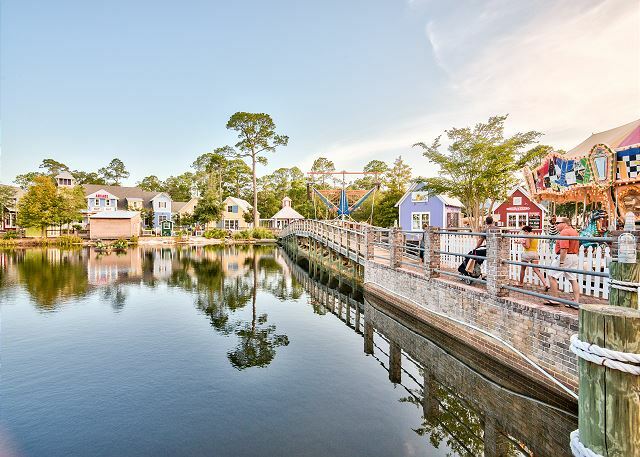 Our first experience with Baytowne Warf was in 2016 and we loved it and decided to return again this year. Staying two years in a row gave us a good perspective of the accommodations and I can tell you 4409 Bahia is a very good value. The location, decorating, and overall experience was excellent. We will be back again next year. Gregory, Thank you so much for your kind review. We were happy to host you and hope you will call us for your next vacation! 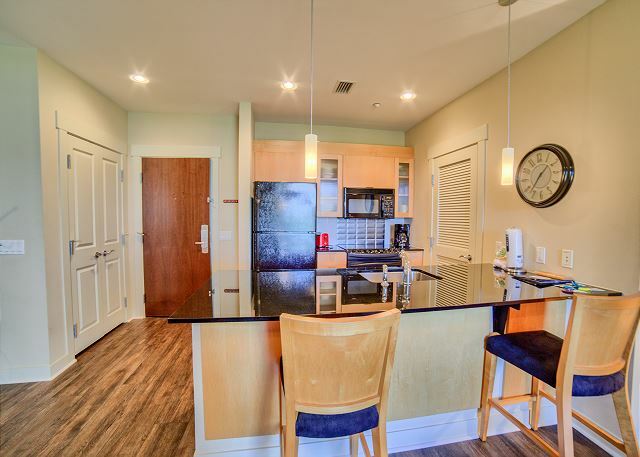 My husband and I stayed in this Bahia unit in Sandestin for two months and felt right at home. The unit had everything we needed for an extended stay and the location was perfect. A nice view of the pool off the balcony and close proximity to the village and marina. 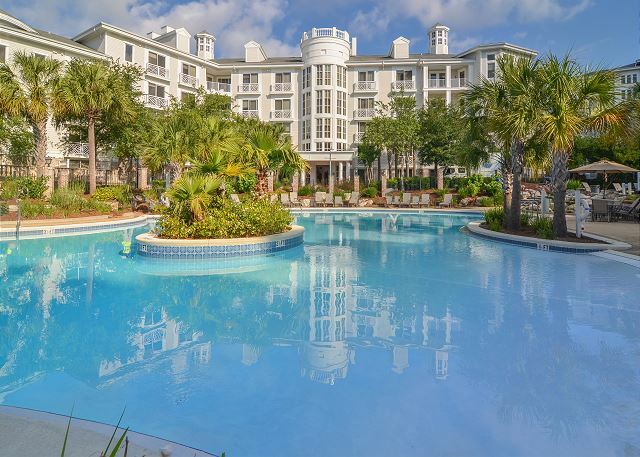 The people at Destin Memories were very attentive, quickly answered any questions and all around easy to work with! Shade, Thank you so much for your kind review. 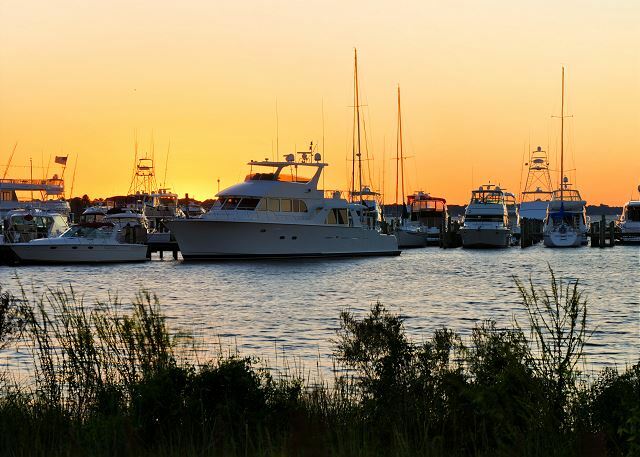 We enjoyed having you stay with us and hope you will keep us in mind the next time you dock your boat in Destin. Our vacation at Bahia was fabulous! There is a convenient parking garage, the entire property grounds were so clean, with staff on site constantly keeping things clean. Our room was great, and had everything we needed to make our stay perfect, even rafts, beach chairs, and boogy boards. Our balcony overlooked the pool. 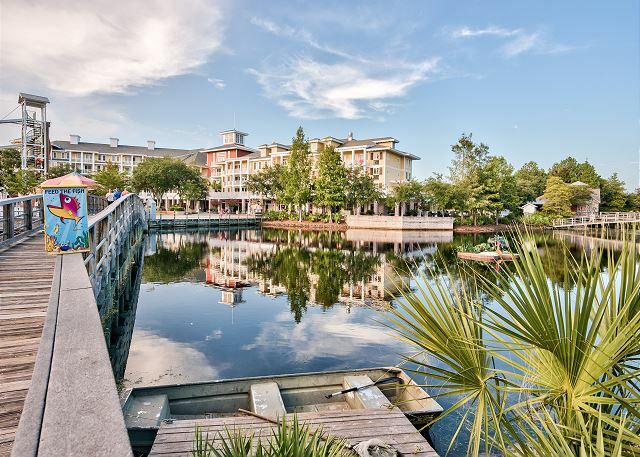 Bahia is walking distance to Baytowne Wharf, where we walked to every night to dine, and do all the kids activities. It is across the main highway of the beach, that had a convenient parking area just a few steps from the beach. We will definitely be back! Dear Michele, Thank you so much for your kind words. I was happy to hear your vacation was such a success. We look forward to hosting you and your family again soon. SUBERB CUSTOMER SERVICE/WE FOUND OUR NEW VACATION DESTINATION! Superb. 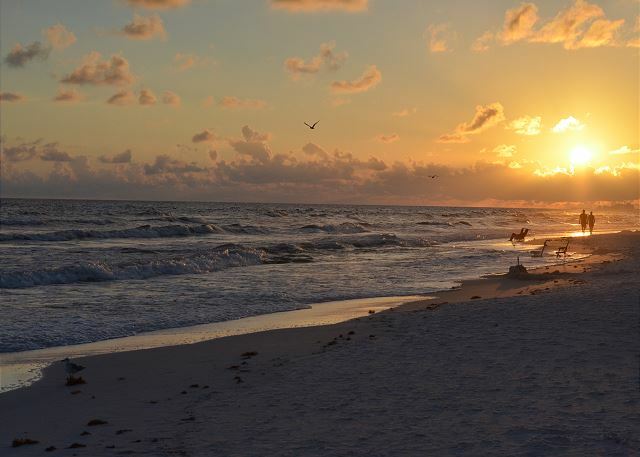 We will no longer go on vacation in the AL/Fl area ANYWHERE else! 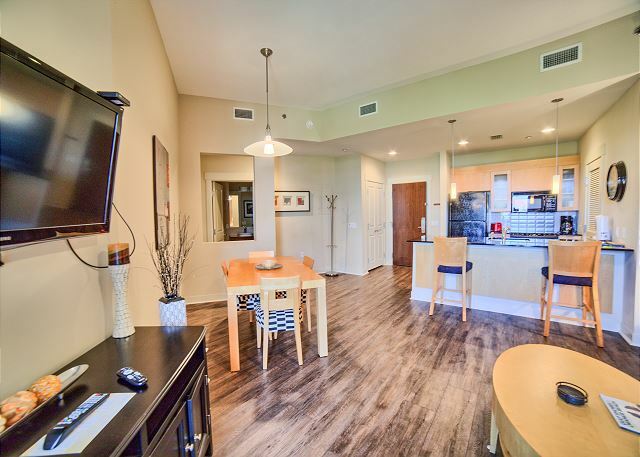 We loved all the amenities available in our condo unit and Baytowne itself. This will be our yearly Memorial Day weekend vacation spot!